Send this wonderful gift of Stunning Parker IM Metal Twin Chiselled GT Ball Pen in Black Color to express your love and affection. 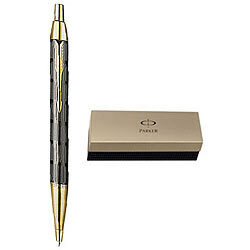 This pen having Gold Plated Trims with decorative coating is made of brass in amazing Black color. It is nicely presented in a Decorative Gift Box.